Us muckrakers in the gay print media are used to seeing yearly treatises claiming our demise. Whether it be bloggers with out-sized bravado claiming their site will be the end of all local LGBT papers or some new-kid-on-the-block publisher who chews off more than he or she can financially digest, it seems someone, somewhere perenially will boast that this is the year the country’s gay press dies. Reality – and those pesky things called facts – however always gets in the way of these doom-and-gloom projections. Case in point Michael Lavers’ incredibly poorly sourced Village Voice Pride piece last month claiming “Gay Print Media on the Wane.” My colleague Kevin Naff, who helped resurrect the Washington Blade with his coworkers last year, does a bang up job of breaking down the fatal flaws in the article, from not bothering to include editors and publishers from gay papers to the Voice’s neglecting to tell readers of a huge conflict of interest in having someone from the online Edge Network pen the piece. There is one thing Naff – and Lavers – does not point out which makes the article’s logic even more filled with holes. If you read through the company’s own press releases, a majority of its content comes from the very local gay print media that Lavers, Edge’s national editor, says is near demise. And those partners include some of the country’s biggest, oldest and most well-known LGBT newspapers, including the Bay Area Reporter (my paper) Windy City Times, and the Dallas Voice. Not to mention that the publishers of Boston LGBT paper Bay Windows are also executive vice presidents with Edge Media Network. So it is impossible to read Laver’s boast that Edge is “fast becoming the new gay press establishment” and not laugh out loud knowing that it teamed up with us “old gay press establishment” types in expanding to cities across the U.S.
Further dousing the “online cannibalizing print” storyline is the latest reports about advertising dollars spent on LGBT papers. Several papers, such as the Blade, the Seattle Gay News and the B.A.R. are reporting that their Pride editions this year – normally a gay paper’s biggest issue – saw advertising increase by double digits. 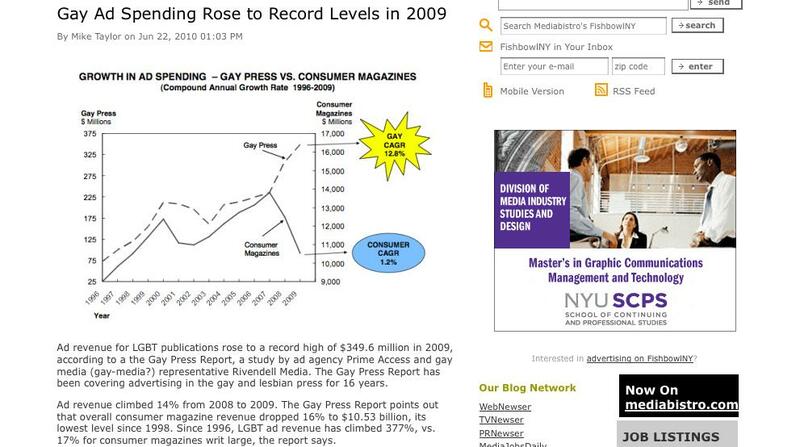 Also, according to the latest Gay Press Report, issued by Rivendell and Prime Access, Inc, the annual report found that 2009 advertising in the gay and lesbian press was up 13.6% over 2008. Despite a bad economy and a great deal of turbulence in the advertising and publishing worlds, LGBT publications managed to accomplish a banner year in several respects, earning a record $349.6 million in advertising revenues,” stated the report. ﻿”Growth in the gay and lesbian press continues to outpace growth in consumer magazines, as LGBT advertising revenues have grown a phenomenal 377% since 1996 (the figure for consumer magazines is 17%). This translates into respective compound annual growth rates (CAGR) of 12.8% and 1.2% during the same time period, demonstrating that ad revenues in the gay and lesbian press grew more than ten times faster than that of consumer magazines. • The proportion of gay-specific ads in the LGBT press (ads that directly portray gay and lesbian consumers and their lives in artwork and/or messages) continues to grow, and has now reached a record 61.9%, up 7.8% since 2008. This represents a remarkable advance since 2002, when “gay-specific” content was seen in only 9.9% of all ads,” stated the report. The report is based on advertising during the month of April in “all publications aimed at the LGBT market – local newspapers, magazines and A&E guides, as well as national magazines,” according to the companies. Thus this year’s report is based on 251 publications, the entirety of the gay and lesbian press published in April 2009, or 136 individual titles. The combined circulation of all LGBT publications is now 2,387,750, down a significant 27.6% since 2008. As discussed below, several publishers cut their frequencies early in 2009, as soon as they realized that ad pages were down for their individual magazines. Later in the year many relaunched, and were thereby able to survive. Nevertheless, circulation figures were clearly affected, as was number of ads. In 2009, the gay and lesbian press consisted of 251 issues (27 less than in 2008), representing 136 individual titles. Even though the number of issues is somewhat less than in 2008 (especially in the realm of local magazines and newspapers), this is no cause for alarm. The number of individual titles, for example, is up six since last year. Such changes mean little in the life of the gay and lesbian press. While there are some long-lived titles that publish year-to-year, most change over time. For example, in an average year, about 10 new titles enter the mix, and another 10 cease publication. Even if the overall numbers in 2009 matched those in 2008, the titles would not be the same. In difficult economic times, niche publications are the first to go (as well as the first to recover). Thus early in 2009 (within the time frame of this report), it became apparent that several prominent LGBT titles were struggling (page counts were painfully down). Thus several immediately curtailed frequency, resulting in reduced circulation figures. Toward the end of the year (beyond the scope of this report), some publications failed – most notably the loss of two major titles, Genre and Jane and Jane – but most did not skip a beat and have since rebounded (to be referred to in our 2010 report).